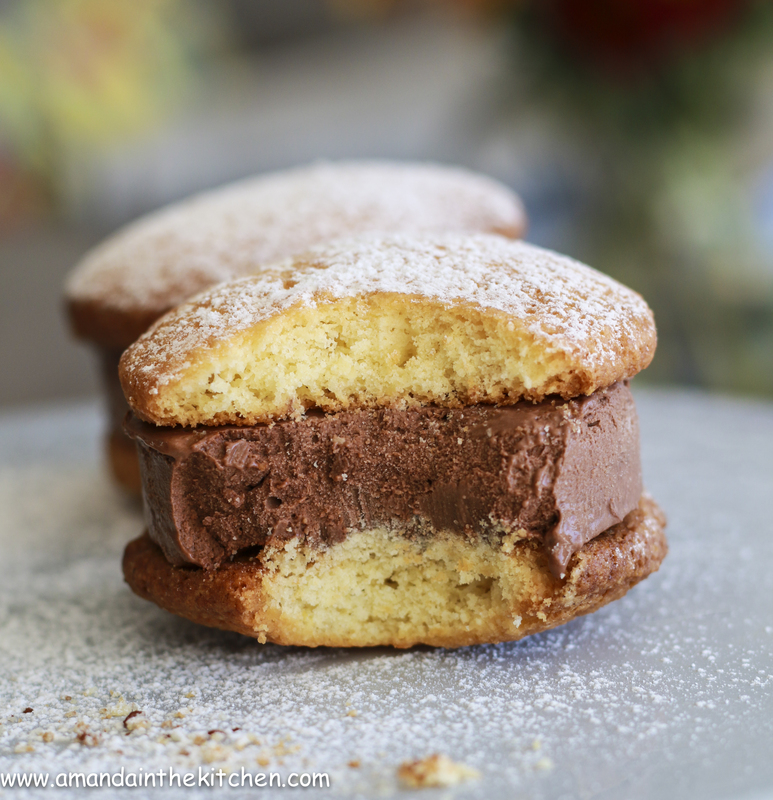 A biscuit ice cream dream - perfect for afternoon tea or as a dessert! Mix all the dry ingredients together including the coconut and the sugar. Rub in the butter until the mixture resembles fine breadcrumbs. Mix the beaten eggs and the milk together and add this to the dry ingredients and combine until the mixture resembles a sticky dough. In order to have a nice shaped biscuit, roll the dough up into cling film to form a tight sausage and chill for about an hour or until firm. This helps when cutting the biscuits. If too lazy then simply roll a teaspoon of dough in the palm of your hand and press with a fork. Slice the rolled dough, when firm, into slices remembering to remove the cling film first. Bake at 200ºC until golden brown. Leave to cool in the tray before lifting off as the GF biscuit is always a little delicate. Bring the milk and cream to a simmer. Beat the eggs, sugar and salt until pale, in a separate bowl. Add this to the heated cream mixture in small batches off the heat so as to not cook the egg and curdle it. Return to the heat and whisk until it reaches a temperature of 85ºC. Add the cocoa and chocolate to this and whisk until combined. Set it aside to cool before churning in an ice cream machine or using the old fashioned method of fridge freezing it and stirring it every hour until it is frozen. Once churned spoon it onto a 20x20cm tin lined with cling film. This makes it easier to cut into the required shape for ice cream sandwiches later on. Cut out discs of ice cream with a cutter. It is best to heat the cutter by dipping it into hot water first, this makes it so much easier to cut through the frozen ice cream. Lay a mielie/maze meal biscuit on a plate and top it with a disc of ice cream, followed by another biscuit. Dust with icing sugar and dig in. Happy smiling faces!